The Journey: Quebec, Ontario, Uganda then finally...Chad. Quebec, Ontario, Uganda then finally...Chad. Well it has come down to our last week in Quebec. Actually, not even that...more like 4 days! The next 4 months will certainly keep us on the edge of our seats. Many have been asking about our schedule and where we'll be in the next months. I've tried to keep the following itinerary brief but the sheer complexity of the upcoming journey has required some extra explanation in some places. But we take courage from looking back and realizing the things God led us through didn't look any easier than this at the outset. We'll spend Christmas and New Years with family sharing our time between London, Kitchener and Meaford. I need to go out to Three Hills, Alberta to renew my IFR rating which re-qualifies me to fly by instruments only. I could do the renewal in a number of places but I'm in great need of the specialized training that I'll be able to get at Prairie. It has been 2 years since I really used my IFR and MAF's plans for us in the near future require that I get a thorough update of my IFR. See below for more on why this is the case. We depart from Toronto and fly to London, England. We'll be taking a course to prepare us for our work in Chad. It covers the day in and day out operations of MAF and focuses on introducing us to cultural differences, security protocols and what to expect in Chad. Grandma (Phil's mom) gets to come over with us to take care of the kids while we're "in school". This beats MAF trying to find a third party caretaker for the kids (in the last few years the UK has beefed up the regulations on paid childcare, bringing Grandma makes way more sense). We're all looking forward to these last couple of weeks together. We have a couple of days in the UK to breathe (and to wait for our next flight) before continuing south and saying goodbye to mom/grandma. Kaitlyn and Lily are looking forward to seeing where the Queen lives. 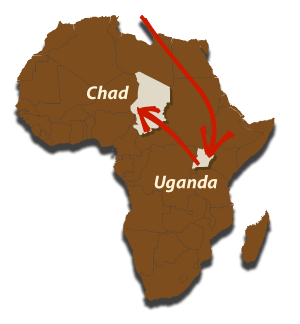 Mom flys back to Canada and we head down to Uganda. Yup, you read that right. Circumstances are such that it was looking like two pilots would be arriving in Chad to be trained on the same smaller Cessna 182 at the same time. They've asked us to delay going to Chad and instead we'll go to Kampala, Uganda first for 3 months as I get trained on the larger Cessna Grand Caravan. The Caravan has a turbine engine (not reciprocating), it carries up to 14 people (10 more than I'm typically used to), and it is flown only on an IFR flight plan (IFR means not having to dodge clouds and not needing to be able to see the ground at all times). These are major changes for me but they do make logical sense when the long-term effectiveness of the Chad program is considered. This option gets a new pilot trained on each of the planes currently in Chad. They have been dealing with a chronic shortage of pilots for quite a few years. The program in Uganda is well outfitted for giving me lots of practice – I'll be flying at least 50 hours with their training pilots on actual MAF flights around Uganda, into DRC and up into South Sudan. It will be a very steep learning curve but I relish both the challenge and opportunity to experience such a rich variation of locations, passengers and types of flying. We will be living in a house nearby the other MAF people – one family, the Derksens, happen to be good friends of ours from Three Hills. They've been in Uganda for about a year and are looking forward to showing us the ropes. If you're still with me, take courage, the ride is almost over. The Uganda program can handle the training of a pilot once he knows the basics of the Caravan but they don't offer the initial ground school there. For that, MAF sends their pilots down to the MAF South Africa program in Johannesburg. They have the facilities to run a 2 week, in depth course on the Caravan which includes plenty of simulator time and several hours in the actual plane. The hiccup in this plan is that I leave for this course after only having been in Uganda for about a week. Merilee and the kids will get to be introduced to Africa by our friends and the many other great people nearby, but it's still going to be a stressful first couple of weeks for her. Pray that she will rely on the One who can sustain her and see those two weeks as a time of stretching and growing for the years ahead in Chad. We are thankful for the great support they'll have from other families around them. Two weeks later, I'll return from South Africa and spend a further two and a half months getting really used to the new plane. When the instructors in the Uganda program deem that I am ready we will pack and fly, for the last time in a while, to N'Djamena, Chad. The arrival in Chad will have been a long awaited one and after over 7 years of not being settled we will enjoy the chance to get some roots in the ground. If you've made it this far, thank you for taking the time and please consider praying for us along the way. We'll try to keep you updated as things progress.